It is no secret by now to long time readers that I am an Exfoliant Junkie and I'm always up to testing a new scrub (both body and face!) and I may have found a summer perfect pick! 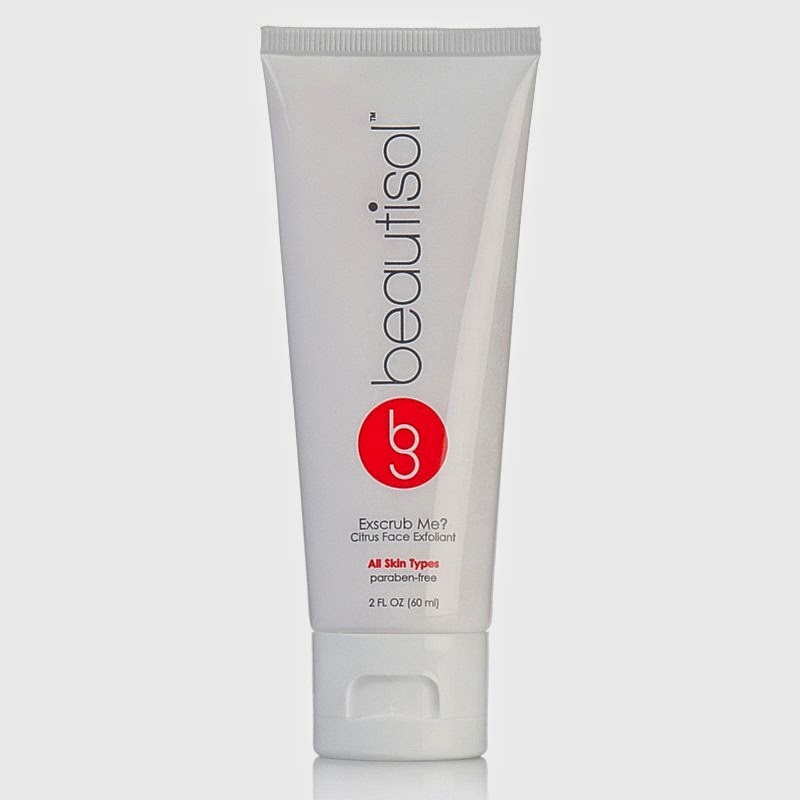 I'm testing out beautisol's Exscrub Me? Citrus Face Exfoliant which is safe for All Skin Types and Paraben-free. I love this one for summer as that burst of citrus zing is a great scent during summer months. (I would use it in winter also, but it depends on how you feel about Citrus scents I guess.) This one will surprise you, it doesn't actually feel 'gentle', don't get me wrong, it's not super rough and won't irritate sensitive skin, but you do literally feel it working. It's not one of those 'so soft' exfoliants you wonder if it's actually sloughing off the dead skin, you can feel it but it does not strip or over dry your skin, it leaves your skin feeling soft and smooth and a little went a long way, I was actually able to do my face, neck and hands with a very small amount. Oddly enough I was actually immediately impressed more with the noticeable difference on my hands (so I guess I have been neglecting them lately)! As a result, I would just as easily recommend it for your hands as I do for face. I for one find my face gets oilier in summer and to keep the skin looking renewed and bright I like to exfoliate as often as my skin will allow. I sweat more in summer so I tend to go lighter on foundation (if I wear it at all, usually I will just do a tinted moisturizer or BB/CC Cream instead), and I try to exfoliate to keep my pores happy. It promises to make your skin feel as soft as a baby's caboose and warns you that it will scrub years off your face so to keep your ID handy! Exscrub Me is a good price point ($17 directly on beautisol's website) and a little goes a long way, if you take a moment to open your pores, either with a warm towel on your face before you apply or a bit of steam from the sink with a towel over your head you will find this even more effective on your skin. I would actually wait a bit after before applying anything over it whether you use it in the morning or at night. With some scrubs I would find my skin feeling too tight afterwards so I would want to apply either serum or moisturizer right away, but with this one, I don't get that tight skin feeling, just smooth and clean! What is your go-to skin Exfoliator Butterflies? FTC Disclosure: I am a member of the iFabbo Shop Network. This is NOT a compensated post, I was provided product for editorial consideration. This is NOT a sponsored post and all opinions are 100% my own! I am disclosing this in accordance with the Federal Trade Commission 16 CFR, Part 255 - Guides Concerning the use of endorsements and testimonials in advertising, you may check our Giveaway and Disclosure Page for additional information regarding Ascending Butterfly Disclosure.